Cooper Landing esta’ aninhada entre as majestosas Montanhas Kenai, bem ao lado das magnificas aguas de cor turquesa do lago Kenai e dos rios Russian e Upper Kenai. Esta área tem sido habitada desde o ano 2.000 AC, quando a tribo Kachemak Riverine estabeleceu campos de pesca ao longo destes abundantes rios. Os índios Dena’ina Athabascan chegaram na área por volta de 1.000 AD e dominaram ate um pouco mais de um século atrás. Cooper Landing e rodeada pela Floresta Nacional Chugach e pelo Refugio Nacional de Vida Selvagem Kenai. A convergência de majestosas montanhas, rios, áreas de trilhas bem mantidas, espetacular pesca esportiva e vida selvagem abundante faz desta área o destino favorito para recreação ao ar livre tanto para os moradores do Alaska quanto aos visitantes ‘a procura de aventura. A cidade foi originalmente chamada de Coopers Landing, pelo fato de Joseph Cooper ter chegado aqui em 1884 ‘a procura de ouro no Rio Russian e nos riachos próximos. O próprio Rio Kenai servia como o principal meio de transporte na área. Uma estrada de Seward a Anchorage foi construída em 1938 mas, antes disto, havia somente a conexão por via férrea entre as cidades. Somente em 1950 que a estrada Sterling foi finalizada e passou a ligar o restante da Península de Kenai com Anchorage. Cooper Landing e um dos melhores locais no mundo para a pesca esportiva com fácil acesso ao rios Russian e Kenai por estrada. Estes rios proporcionam aos pescadores uma das melhores oportunidades para a pesca esportiva do Alaska. Cooper Landing is nestled in the majestic Kenai Mountains beside the beautiful turquoise waters of Kenai lake, the Upper Kenai and Russian Rivers. This area has been inhabited as far back as 2000 BC when the Kachemak Riverine tribe established fish camps along the Rivers. The Dena’ina Athabascan Indians arrived in the area about 1000 AD and dominated until just over a century ago. Cooper Landing is surrounded by the Chugach National Forest and the Kenai National Wildlife Refuge. The area’s convergence of scenic mountains, rivers, well-maintained trails, spectacular sport fishing and plentiful wildlife make it a favorite outdoor recreation destination for both Alaskans and visitors looking for an adventure. The town was originally called Coopers Landing, named after Joseph Cooper who arrived in 1884 to search for gold on the Russian River and nearby creeks. The Kenai River itself served as the principal means of transportation in the area. A road from Seward to Anchorage was built in 1938 but, before that, only the railroad connected the towns. 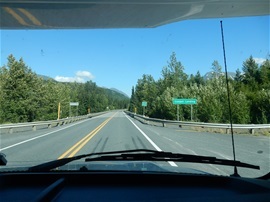 It was not until 1950, that the Sterling Highway was completed and it connected the rest of the Kenai Peninsula to Anchorage. Cooper Landing is home to some of the best sport fishing in the world with readily accessible road access to the Upper Kenai and Russian Rivers. These rivers provide anglers with some of Alaska’s finest yet affordable fishing opportunities. The U.S. Fish and Wildlife’s “Russian River Ferry”, at mile 55, crosses the Kenai River to allow bank-fishing anglers to access the Kenai & Russian Rivers Confluence, which is the most productive Sockeye(Red) Salmon sport fishery on earth.